Former Police Chief Lee Donohue, left, has been named Pacific region director for Akal Security Inc.
Ex-police chief Lee Donohue is promoted at Akal Security Inc. Question: Is Hawaii's low unemployment rate making it hard to hire security guards? Answer: Yes, it's very difficult to hire good, competent people. Like other companies, we're struggling. We are using more technology, if we can. Let's say we have a post that would normally take three guards, and we could replace one guard with remote monitoring and still keep the level of security at the site the same level or better, we'll do that. 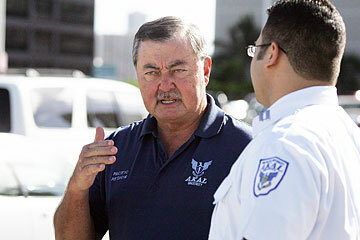 » New job: Akal Security Inc. has promoted former Honolulu Police Chief Donohue to Pacific regional director. Donohue joined Akal in 2004 after retiring from the Honolulu Police Department, and has served as the chief of operations and chief of executive accounts in the Pacific Region. » Description: Akal has 630 employees in Hawaii and annual revenue ranging between $13 million and $18 million. The company's Pacific region also encompasses out-of-state contracts, including Guam and Saipan. » Major customers: Hawaiian Electric, Ala Moana Center, Royal Hawaiian Shopping Center, Hickam, the federal courthouse, the FAA towers at Honolulu Airport and some of the smaller hotels in the state. Q: Do you have many job vacancies? A: Currently we're down, I'd say, probably like 10 percent. Q: Are the wages high enough? A: We have a base where we're starting our base rate at $11 an hour. For the security industry, that's pretty high for a start, but we're starting everybody at that level. Two months ago it was at $10. Prior to that it was even lower. We moved to a $10 level just two years ago. Q: Will base rates need to keep rising? A: Even at $11 an hour it comes to $22,000 a year, and that's just over the poverty line in Hawaii. Security is going to be big business in the future. ... The skills are a lot different than they were. Q: How have the skills changed? A: Now they have to have computer skills, AEDs (automated external defibrillators), CPR. There's a whole lot of things they have to know. It's almost as much as a police officer today. 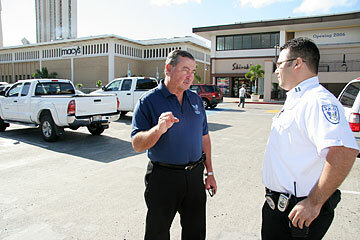 Above, Donohue spoke last week with Akal security guard Mike Gonzalez at Ala Moana Center, one of Akal's clients. Q: What are your plans for the company? A: I'd like to see us diversify a little more, become more involved in technology, diversify and provide more field operations opportunities out there, also to be able to service customers both at home and at their businesses. I'd like to see us move also into investigations. Q: Are you seeing increased demand for home security? A: Yes, and with technology that's available, it's going to be exciting. You have closed-circuit televisions and wireless, and even through Internet protocol you can pull up the cameras in your home while you're away, and we can monitor it for you too. This also applies in the business place at the work sites. That's the trend today now.